The Department Resources Group (DRG) referral page is available for chairs seeking a program review. The page provides a list of DRG consultants along with each consultant’s institutional affiliation, program type, CV, and statement of consulting approach and availability. DRG consultants receive training at each ASA Annual Meeting and are in regular communication throughout the year about trends, data, and new resources that can help build strong departments. 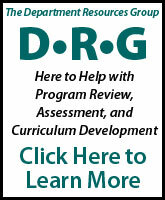 DRG consultants are committed to the advancement of the discipline and to empowering department chairs and faculty. For more information, visit www.asanet.org/teaching/drg.cfm.